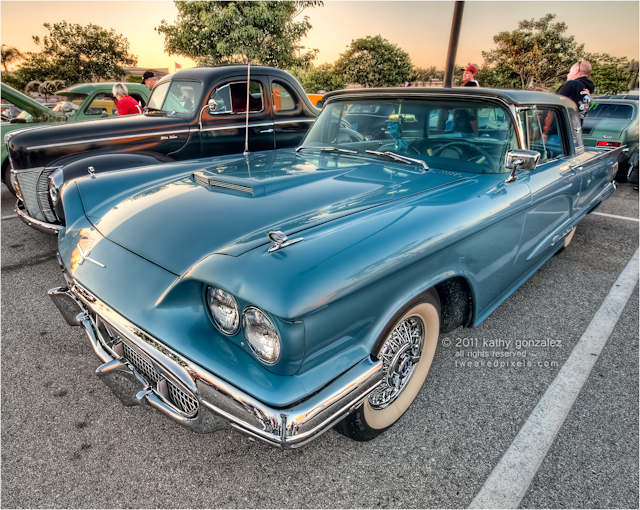 found this tbird at the end of the row, edge of the show at ruby's last friday. was waiting for the sun to drop lower and had gone round to shoot the back end, hoping to catch the sky changing. instead i was still being blinded by the giant orange fireball in the sky, so was being forced to shoot real low. the owners happened to be back there. they were curious about what i was doing. i handed them my book to look at while i stalled for time. at some point, some guy comes over and asks what they were doing with some other guy's car? turns out there are apparently two almost identical tbirds, and that they also live quite close to each other. this owner pointed out his custom plate to the guy. i would have also pointed out the dent over the light. or we could make up a story about how it got the dent, and the other car is the evil twin...or i could have just taken out the dent, but then how would you know which is which? anyway, they asked me to take a few up front, so i did. hard to decide between this shot and another that had more of a light flare from the sun on the hood. finally picked this one because it showed more of the length of the car, and i liked seeing the hubcaps.